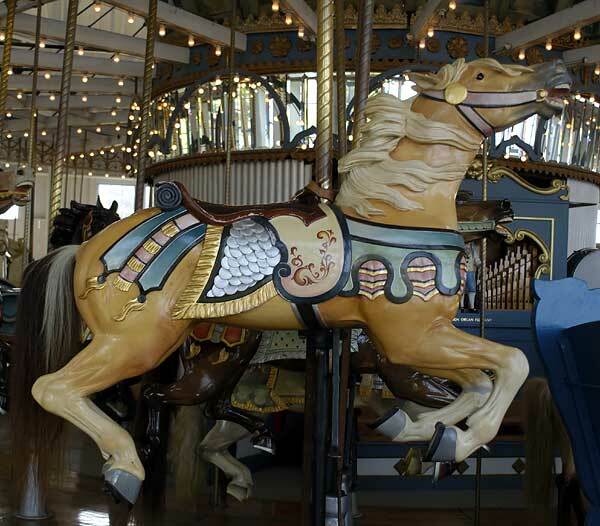 Here's some pictures I took of the Looff Carousel at Lighthouse Point Park in New Haven. The last time we were here was in the winter, and we didn't even notice what this building was. This time I had brought my relatives here as a refreshing, unwinding stop, before having to take them to the Tweed Airport in East New Haven, for their return flight to Indiana. When we strolled over to the lighthouse to take pictures, we saw this building and heard the organ music. What a shock to find out there is a Looff Carousel in New Haven! 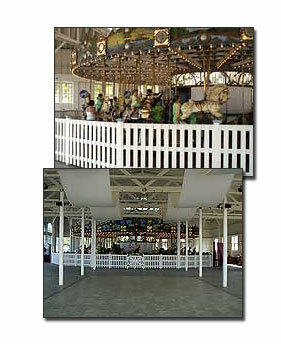 The only one I had seen before and even rode on, was the Looff Carousel at Crescent Park in Riverside, RI. 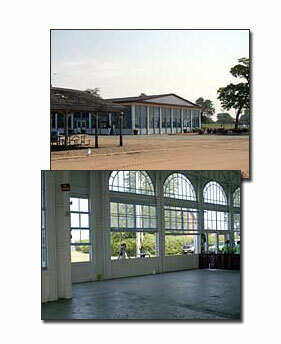 This carousel house sits not very far from the lighthouse, and as you can see there is a picnic shelter nearby. The windows in the place are huge, my daughter is standing outside of one. The area is so big inside it would seem the front area may have been used for dancing at one time. Here is a picture of the view of the Looff carousel from the front of the building. When I asked the ladies who were running the carousel about the history of it, this is what they told me. It opened in 1911, but closed in the 1980's for renovation. It has been reopened but only for private parties. She said the walls were lined with all sorts of little vendor shops, but they took them all out. Each of the carousel horses are beautifully carved and painted, the tails for the horses are real horse hair. It has 4 rows and a Stinson Band Organ.